It begins in the imagination. Like any good photography, astrophotography starts with vision. What is the shot you would like to take? What elements would it include? How will they be arranged? What’s the final look of the shot going to be? The shot that we are going to unpack in this eBook started life as a conceptual idea I had. In my mind, I could see exactly what I wanted the outcome to be, even before I went anywhere near the location. But, more so than regular landscape photography, the technical challenges of shooting in low light mean that you can’t simply jump in the car, turn up at the right place at the right time, press click and realise your vision. All aspects of photography benefit from good technical skills and understanding. But astrophotography especially does so. So, in this eBook, my goal is to unpack both those elements. The artisanship - how you can use your camera to bring your vision to life. I have come to love this constellation very much this year. Since first photographing it over Belfast’s Cavehill in the snow in January, I’ve been keen to find places to photograph it that provide a real Northern Irish context to it. On my online meanderings one day, I saw someone who had photographed it with a little stream in the foreground. The way the water fell over the rocks created lovely white water in long exposures and I thought it made for a strong image. But where in Northern Ireland offered somewhere where I could have a go at a shot like this? I wanted a decent amount of water flow, preferably a drop in the water for the long exposures. It had to face south to south-west so that I could get Orion in it. Was there anywhere like this? Then it struck me: Dunseverick. It had the waterfall there, so the water drop was ticked off. And there was a headland of rock that protruded out past it so that I could turn back south for Orion. 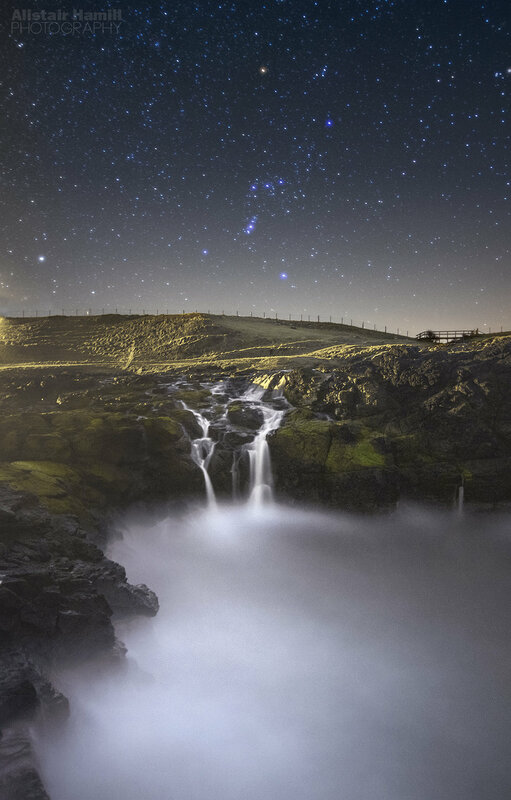 In my head, there was the constellation sitting above the waterfall in the sky, with the fall of the white water set in stark relief against the dark greys of the basalt rock, with white water in the ocean in the foreground. All I needed was the right conditions: clear skies. But this, of course, is Northern Ireland. So a few weeks went by, with Orion moving more and more out of position. Would I get a chance to grab this shot before the season was out? Eventually, there was a clear night forecast, and I headed to the coast, straight for the waterfall. Conditions were perfect. There was Orion, just above the waterfall as I had hoped, with glorious clear skies meaning the Hunter was so very visible, even against the blanket of other stars vying for attention. I got set, pressed the shutter button, and a few seconds later, this shot appeared on my camera screen. Except, of course, it didn’t! So, what of the technical settings that allowed me to produce this shot? Your big challenge in astrophotography is getting enough light to fall onto your sensor. There are two ways you can do this: one is to have a wide aperture lens (such as f2.8 or wider); the other is to leave your shutter open longer. Think of it this way. Imagine you are trying to collect rain falling from the sky into a jar. If you have a huge funnel you can put in the top of it, you can collect more drops of rain. If you hold your jar out for a longer period of time, you’ll collect more rain. Wider and longer equals more collected. According this this theory, you can just leave your shutter open for five minutes and boom - job is done! But it’s not that simple, for two reasons. 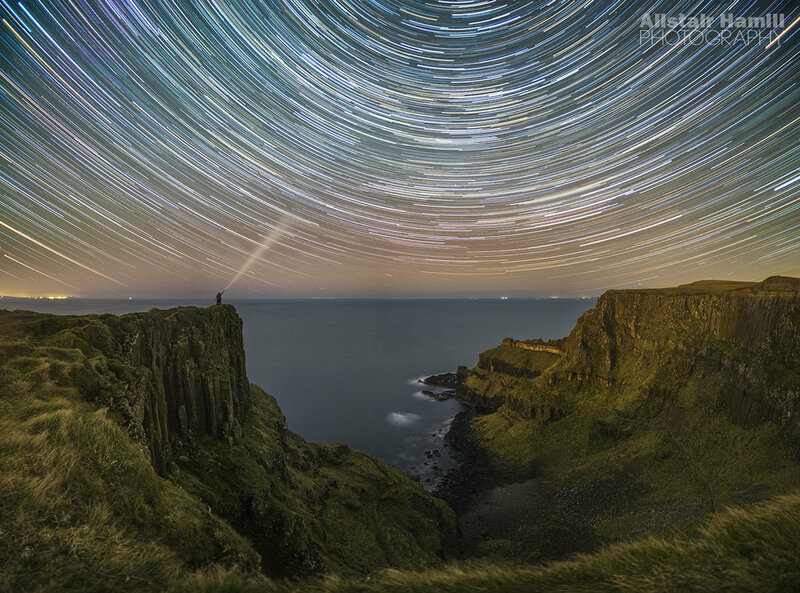 Due to the spin of the Earth, if you leave your shutter open that long, the stars will begin to trail. And, instead of having those wonderful spots of light, you’ll have lines. Not exactly what our vision was now, was it? If you keep your shutter open that long, you are likely to blow out the highlights of the stars, losing those lovely colours that the stars and nebula of Orion bring. So, keep the exposure shorter then. For a 16mm shot like this one (on a Fuji camera with a 1.5 crop factor) I can go for 30 seconds before getting star trails (Google the 500 rule for more information on how to calculate your maximum exposure time). But, when I do that, I end up with a foreground that’s far too dark and underexposed. Here’s our dilemma: expose for the stars and the foreground will be too dark. Expose for the ground, and the stars will trail and have blown highlights. 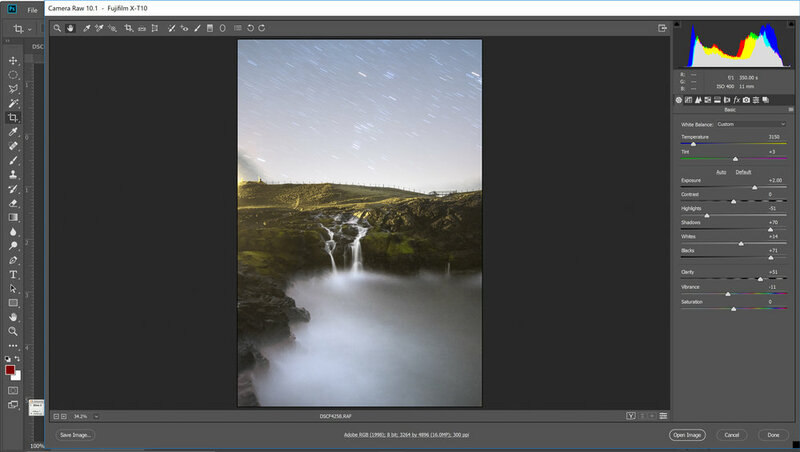 The solution is simple: take two exposures, one for the stars and one for the ground. And that’s exactly what I did here. This technique is a very powerful one for allowing you to get well balanced night time shots. I've included the two jpgs straight out of camera so you can see what I was working with (although, I was shooting in RAW, of course, to give me greatest flexibility in post production). As you can see, the stars are acceptably sharp and the sky is well exposed. You can make out the foreground, but if I were to pull out any of the shadows in Lightroom, it would quickly become very noisy. The foreground here still looks quite dark, but as I was shooting at ISO 400 instead of ISO 6400, I knew I could pull out the shadows whilst controlling noise much better. You’ll also notice just how much star trailing there is in this exposure time (although the lower ISO actually allowed me to retain colour in the stars). The first step was to battle the light pollution. A sodium street lamp to my left was spilling in a lot of orange light onto the scene - and that’s even with me shooting with a White Balance of 3200 Kelvin! Reduce the overall saturation of the foreground. This ended up with me being able to use the sodium light as a pleasant side light to the image, rather than this horrible orange glow. I boosted the shadows in Camera Raw too, and used a Brush tool to bring out the white of the water in the falls and the sea. I've shown where I painted the Brush Tool on this image here, with the adjustments I made shown to the right. Then it was on to the image of the sky. This was much simpler and basically involved the adjustments shown below. This screen shot shows how I used two Gradient Adjustments: (1) one vertical for the sky, with the settings shown (2) one horizontal one to try to reduce the light pollution from the street lamp. Finally, it was over to Photoshop to blend the two images. This was quite straightforward and just involved the use of Layer Masks to gradually blend the sky into the foreground. There weren’t too many stars trailing into the fence at the top, so that job wasn’t as difficult as it might have been! I did other noise reduction techniques there using Nik Dfine, and added some final global levels adjustments, and the image was ready. So, from imagination to realisation. The vision - and the technique. The two sides of the creative coin for astrophotography. Here are a couple more examples of this double exposure technique in action. The first I took just after the Dunseverick one. I headed to the Causeway cliffs to capture this one. Again, I had previsualised this shot, as I knew from a former photo I'd taken here that it can work very well if you have a person posing on the headland! As you can see from this shot, the foreground image comes out quite noisy. So, again, the double exposure technique can be used to good effect here. In fact, to realise my vision for this, I took a series of 6 portrait orientated shots and stitched them together in Lightroom to create a panorama for the land. The reason I did this was because I knew that I'd be face with a dilemma here: shoot to get the full sweep of the bay in, and I wouldn't get many stars for my trails. Shoot for the stars (as I have done) and I wouldn't get the full sweep of the bay. But, with the pano for the ground merged with the sky shot above, I had the best of both worlds! All that remained was the final element - me standing on the headland with my torch. I used the wifi remote for my camera to see where I was positioned on my phone screen, triggered the camera - and stood very still for 30 seconds! I therefore ended up with three images to be blended: sky, foreground and person. Again, this was done using Layer Masks in Photoshop, with a few final Curves adjustments to make the images blend nicely.